I guess I am echoing Kardas post below mine. Trying to shape a blank, I am having the same problem with the fuzzy section of this what I think is Leyland Cypress, but I am not sure. Why is this fuzzy softness, is it the kind of wood itself, or because is green or because is being turned end grain? I guess I could use CA glue as suggested by LesB…. or? Oh, I am using carbide cutters. The carbide cutters are the problem. Unless you have the shear cut variety of carbide (most aren’t), you will get some tear out in most woods, especially in softwoods and also in end grain. You will get a much cleaner cut if you use a bowl gouge because it will do a better job of slicing. It takes a little practice if you have not used them but you will be much happier with the results over a carbide. I had fuzzy results at first while using carbide cutters but learned to clean it up with practice and by not cutting as deep and plying with the angle of the tool. Theres no need for carbide Leyland Cypress is so nice to work. Go back to Hss and grind your bowl gouge with a long finger nail shape. You get much better result cutting into and uphill in the end grain. I have a cabinet I made for myself It’s mostly Leyland Cypress it smells great inside still to this day. You didn’t say what brand of cutter you were using. The new Easy Wood Tools negative rake cutters are exceptional and will help reduce that tearout. The “shear cut” carbide tools are from Hunter or Harrison, and probably others. They use cupped, circular cutters, with tapered cylindrical shape. The cutter is sometimes mounted at an angle to the axis of the handle (Hunter Osprey & Hercules), and used like a small bowl or spindle gouge. 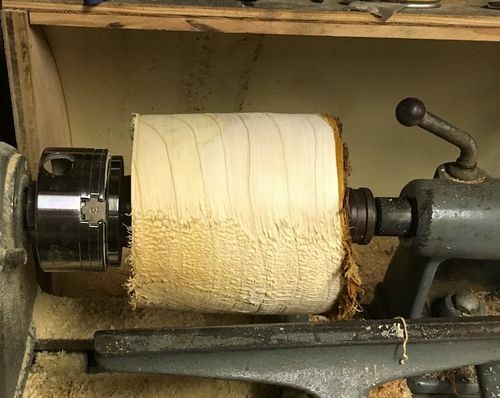 Is this the new age of wood turning to teach other to buy carbide scrapers? Since I am in the roughing stage, I am not too concerned about the fuzzy stuff. I was just wondering why part of the blank came out fuzzy and rest was slick. Taking light cuts did minimize a lot. By the way a do have an Osprey tool from Hunter, and will give that a try and report. Aj2 do not worry, I can see that carbide cutters will not replace HSS. For me it is just a starting point. I did not sink lots money in these tools. I ordered the cutters and made my own holder and handles. It was a quick way to see what the lathe can do. The most expensive cutter is the Osprey ($21+$9shp). A whole set of 5 regular cutters I paid $26. I know I will be paying a lot more for quality HSS. Im not a Turner. Just trying to learn. I don’t see many people yearning for HSS router bits. Im not a Turner. Just trying to learn. I don t see many people yearning for HSS router bits. I dont know anyone yearning for Hss router bits also. Even if someone had the machines,time and skill to sharpen Hss router bits that still wouldn’t make sense. Some woods cut nicely with a good sharp edge esp wet cypress. It’s worth the time and effort to learn how to rub the bevel how to grind differently to suit a harder or softer wood. The op is learning this first hand the reason the wood is tearing out is he cutting straight into end grain. His scraping action of the tool lifts up and breaks the wood fibers. The opposite site of the round blank will also be end grain. Just like the end of a long or short board. 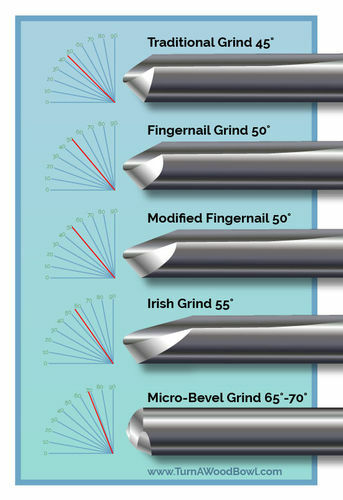 Here’s a pic of different grinds one should master before they wear the title of “wood turner”. I personally like the Irish grind. Ah. It’s the angle of attack that concerns you, not the material. If a carbide tool had the desired shape and could be presented to the wood at the desired angle, it would be ok. But I suppose carbide tools are not made that way. Is that right? Carbide doesn’t not get nearly sharp enough to use like Hss steel. But it does hold up much longer scraping as it compresses the wood fibers. I have a round nose hhs scraper that works just like a carbide scraper maybe even better. I roll a little burr on the edge just like a card scraper. For a wood turning scraper it’s called ticketing the edge. This principle can also be applied to hand planes and machines like jointer knives compared to helical insert heads. The smaller the cutting angle or less rake the most it becomes a scraping action. The larger the cutting angle or more rake its scooping cut. Each one has its advantages but neither will work perfectly for all types of wood. Ocelot, You can use this type of shear cup carbide cutter to get a cleaner cut but in most woods, it still won’t be as as nice as you can get with a HHS bowl gouge, once you master riding the bevel. When done properly with a sharp gouge, you will need very little sanding. Carbide can be a quick way to hog out large amounts of wood but in most cases, you will be get a better surface with a HHS gouge. Even a HHS scraper with a good burr will usually give you a better finish than the standard carbide tools. or because is green or because is being turned end grain? I may be missing something but it looks like the bark is towards the tailstock. This is typically called face work, turning end grain would be like a spindle or most boxes. Turning from the tool rest as pictured you are working against the grain and into end grain twice on every rotation. May be a bit of a reach but the tool rest should be perpendicular and make the cut from the tailstock towards the headstock, then you will be cutting into face grain all the way. or… try as others suggested and present the cutting edge at a 45 -60° angle.